Matthew ran into a couple of issues while attempting to edit some of the original .stl files from Thingiverse, more specifically not being able to edit said models in Autodesk Inventor. After a quick google search, he discovered that to convert .stl files into .dwg files, he needed to use Autodesk 3DSMax. However, he quickly discovered that Autodesk only offered that particular piece of software in the 64 bit variety, and as our school laptops are running a 32 bit operating system, he could either run a virtual machine with a 64 bit operating system or ask IT support to convert the files with their 64 bit machine. As a result, he wrote up a set of instructions on an SD card and included the files which needed to be converted and the installer for 3DSMax. This is all because the Robocup National Competition requires us to have a different robot design as the one we’re using now is almost exactly the same as the prototype made by Curtin University. 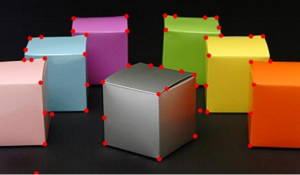 Ryan worked on line and corner detection with OpenCV and Python, and he managed to detect almost all the corners in the picture below.